"Did you hear any stories about this place?" It's easy to tell The Marsh is trying to be spooky because of the reliance on a deep, boomy growl of a stinger used to punctuate seemingly every other scene, even if nothing especially otherworldly is happening. It gets overused a bit here, more so early on in the story, but like pumpkins at Halloween, it's all part of the necessary window dressing for a ghost story. That and things like creepy dreams, giggling spectral girls, menacing scarecrows and a deadly "hexed" marsh are all here, and the debut feature from director Jordan Barker shows some very solid structural promise for having a grasp on the genre, but it is mired in a script that comes completely unglued in the critical third act. Claire Holloway (Gabrielle Anwar) is a gloomy gus of a children's writer who is plagued by a recurring nightmare set in a creaky old house, and when she catches a news story on television about a small town somewhere she gets a glimpse of the very same house. And even if she didn't have extremely furrowed brows to indicate something is wrong, we could tell it's the same house from her dream because it's shot from the very same angle. Funny how that always happens in movies; it's like people dream with perfectly framed establishing shots. So sullen, silent Claire (it seems like Anwar's dialogue in the entire film amounts to about three paragraphs) heads to the tiny town of Marshville, and conveniently rents the same house from her dreams/news story. That's when the weird stuff starts happening in abundance, with flickering lights, ghostly voices and apparitions with glowing eyes being the order of the day. When she discovers the business card of a local paranormal consultant under the couch (? ), she seeks him out to help her get to the bottom of the mystery. The local ghostbuster is the enigmatic Hunt (Forest Whitaker), and the two join forces to unearth the truth, aided occasionally by mildly timid newspaper editor Noah (Justin Louis) who seems to have the hots for the antisocial Claire. That's the general setup, and as Claire and Hunt dig deeper the ghostly weirdness gets progressively more threatening, which naturally includes the offing of a couple of secondary characters. Barker doesn't come close to reinventing the spirit genre here by any stretch, but he does provide most of the standard issue jump scares and supernatural shenanigans in the first two-thirds as the mystery is slowly pieced together, though the biggest problem is that the actual resolution is so confusingly incoherent and contradictory that it doesn't really make any sense. And then there's all that pointless Poltergeist-y wind and bright lights in the climax, which only further muddies the attempts by Barker up until that point to try and tell a moderately creepy ghost story. It's as if the ending completely negates little shimmers of goodness, like a ghost girl wandering across the rafters of barn or a Ring-esque attack on one of the expendable characters. While hardly Oscar-worthy, Forest Whitaker carries the brunt of The Marsh in that skewed, off-balance kind of way that he has, especially as a counterbalance to the permanent gloom of Anwar's Claire. His presence here as paranormal know-it-all Hunt gives The Marsh something to center itself with, something that the monosyllabic role of Claire just can never muster. Anwar's character, troubled as she is, is kind of a dud as a lead, and I found myself more interested in Hunt than her. And that's not the worst thing to happen here, because Whitaker did manage to try and keep me in the story, but then the final reel unfolds and the logic of the payoff more or less vanishes. It's a wandering mess of a conclusion, littered with gaps in logic, and it easily taints the entertaining spookiness of the preceding 85 minutes. Image Transfer Review: The Marsh is presented in 1.85:1 anamorphic widescreen, and the transfer does display some frequent grain issues. Edge detail clarity fluctuates, lacking consistently sharp definition throughout. Colors�especially that chilly blue tint that all of the exteriors have�are never excessively vibrant, instead holding their own with a slightly muted tone that apparently was an intentional choice by the director. Audio Transfer Review: The Dolby Digital 5.1 surround mix is moderately aggressive when it needs to be. serving up ominous creaks and ghostly voices from the rear channels to flesh out the supernatural nature of things; the frequent reliance on a deep rumble to signify something creepy about to happen sounds properly loud and low, as well. Voice quality is clear, with no evidence of hiss or distortion. A 5.1 Thai dub is also included. Extras Review: Extras consist of a set of 9 assorted horror trailers and one of those generic behind-the-scenes features (26m:20s). This could literally be any film being discussed, with typical "the crew was great", "he's a professional" sort of comments sprinkled amidst clips from The Marsh and on-set footage. The disc is cut into 12 chapters, and includes optional subtitles in English, Japanese, Spanish, Chinese, Korean or Thai. 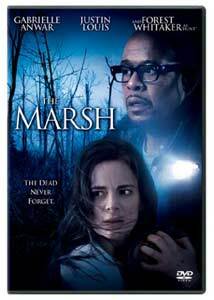 Not a great film storywise (re: weak), but in terms of mood and visuals The Marsh does have its share of suspenseful moments. I'd like to see director Jordan Barker working with a better genre script, because he seems to have the right feel for how to do spooky. Plus, the always watchable Forest Whitaker gives this the extra nudge to make it worth a rental if you're jonesing for a ghost story with an awful ending.